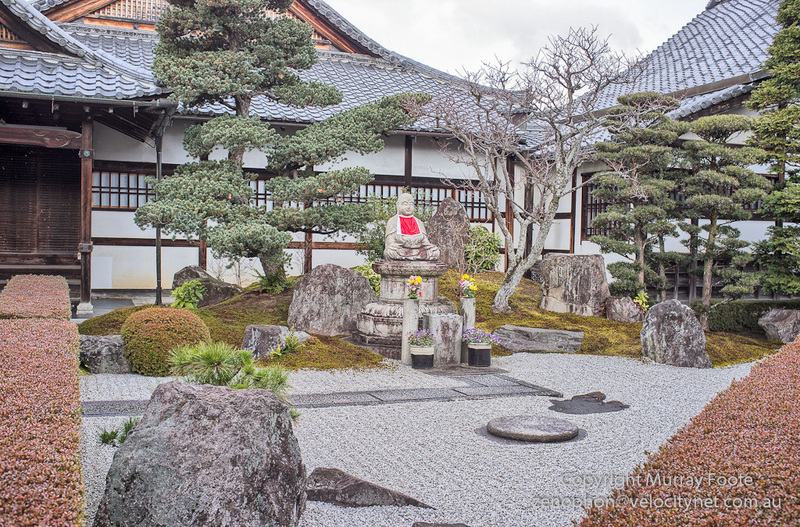 While in Kyoto I stayed in the zen temple Shunko-In in the Myoshin-Ji complex. I started my first day in Japan with a Zen meditation session. There were spaces for about twenty people but there was just me and the Abbot. I was facing a view of the zen garden while fine snow swirled down outside the window. Perhaps some things are not meant to be captured in a photograph. I experienced meditation some decades ago, mainly as a consequence of living rather than as an organised activity, and I had also read about Zen. Zen is not so much a faith as a way of living. The meditation is not as formal as in some other forms of Buddhism, rather a simple way to free your mind from thoughts to assist you to experience directly and to appreciate the pervasive nature of change. Though I didn’t encounter them here, Rinzai Zen also specialises in koan or enigmatic aphorisms that challenge rational thinking as part of the process to self-knowledge. 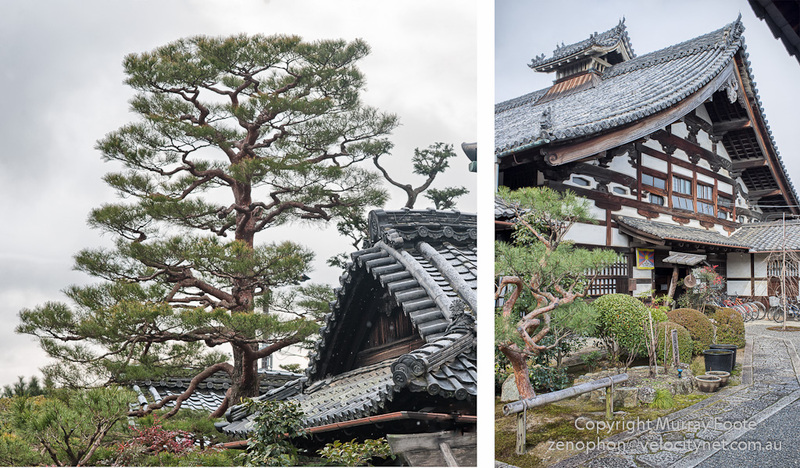 The Abbot mentioned two aspects of Zen that I either was not aware of or had forgotten. One is that Buddha is not held to be a God and so all statues of Buddha are small. Another is that there is no belief in reincarnation. Another interesting thing he said is that people generally think that the lines in the sand or gravel are there to look pretty whereas their primary purpose is as a form of meditation for the person who creates them. You have to have your mind in the right space to be able to draw them regularly and coherently. 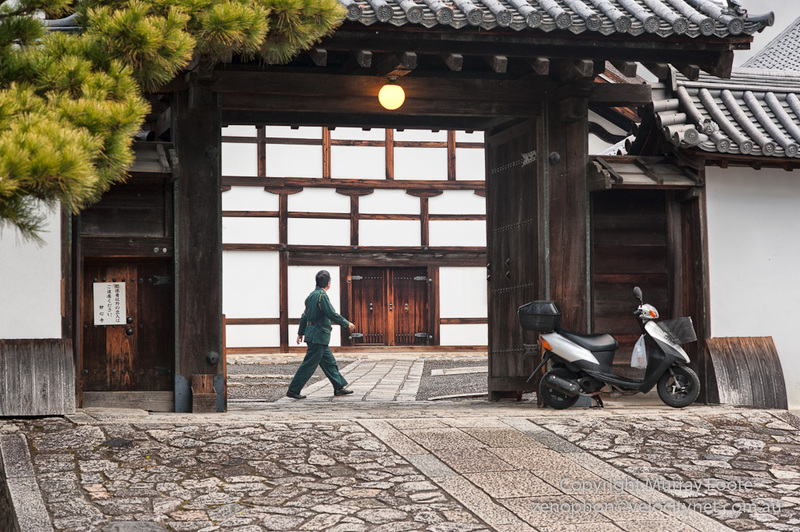 Entrance to a temple in the Myoshin-Ji complex, showing a nice contrast between the old and the new. The Portuguese brought Christianity to Japan in 1549 and the Spanish followed on soon after. After 50 or 60 years there were around 200,000 adherents including some in the highest ranks of daimyo (feudal lords). However, the Shoguns came to realise that the Christians pledged allegiance to their God as a higher allegiance than to the Emperor and so they were ruthlessly suppressed and many executed. After 1637 those few who were left were in hiding. The centre of covert Christianity was in the southern island of Kyushu and when the Americans dropped the atomic bomb on Nagasaki in 1945, the remains of a cathedral featured amongst the ruins. Less than 1% of Japanese are Christian today. 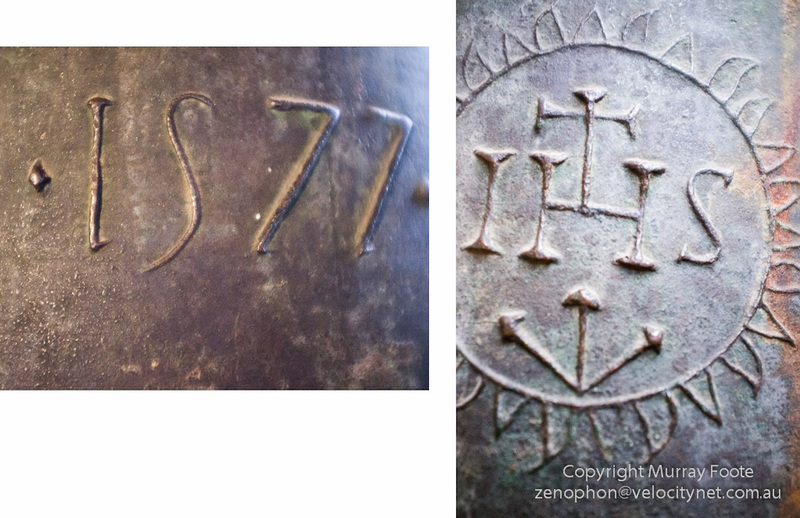 Details of a Christian bell in the Shunko-In temple, dating from 1577. The Abbot's father hid it during World War 2 to prevent it being melted down for munitions. In 1600, an Englishmen called William Adams arrived in Japan on a Dutch ship with a few surviving crew members, all starving and scurvy-ridden. After a few months, Adams established a close relationship with Tokugawa Ieyasu, notwithstanding initial pleas by the Portuguese for Adams’ execution. Ieyasu was Regent at the time and soon to become the first Tokugawa Shogun. Adams became a special advisor to Ieyasu on Western technology and trade, built him a Western ship and was later made a feudal lord. Due to his influence, both the Dutch and the British received trading rights though the British withdrew after 10 years because they brought the wrong goods and were unable to make a profit. After the expulsion of the Spanish and the Portuguese until the Meiji Restoration in 1868, the Dutch maintained the sole European trading outpost from an island in Nagasaki harbour. 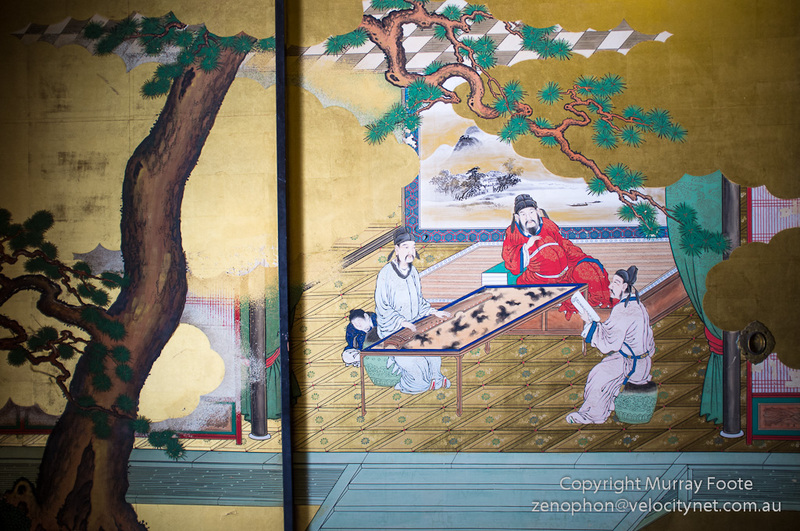 This entry was posted in Japan, Kyoto and tagged Buddhism, Japan, Kyoto, Myoshin-Ji, Photography, Shunko-In, Travel, Zen.